Making connections, partnerships and growing your company may seem like a daunting task when your business is in its start-up stage, but finding the right outlook for your company is a step in the right direction—and that’s what Corinne Sharp, President of Sharp Perspective and one of RIC Centre’s Volunteer Advisors, is here to help entrepreneurs with. 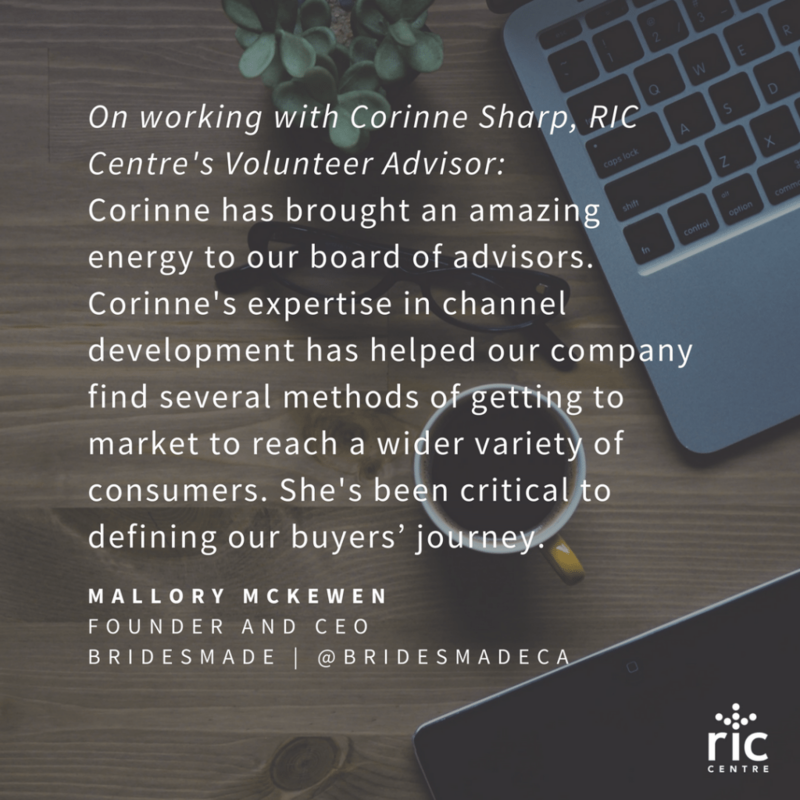 Corinne was introduced to BridesMade, a RIC Centre client, as a Volunteer Advisor. BridesMade is a Canadian company that gives bridesmaids the option of renting or purchasing bridesmaid dresses so they’re not forced to keep the dress after a wedding. Corinne helps her clients focus and develop their go-to market strategies and how they can scale for growth in areas such as business planning, sales strategies, channels and partnerships, and execution for results. According to Corinne, the ability to execute on a strong business plan is something that balances out the dream with the reality. If you are also trying to build an indirect sales channel, knowing how to build partnerships is critical. With over twenty years of experience in IT, three years of volunteer experience as a RIC Centre Advisor and various leadership roles in the industry, Corinne is capable of leading and guiding companies and clients through change initiatives or phases in their businesses. 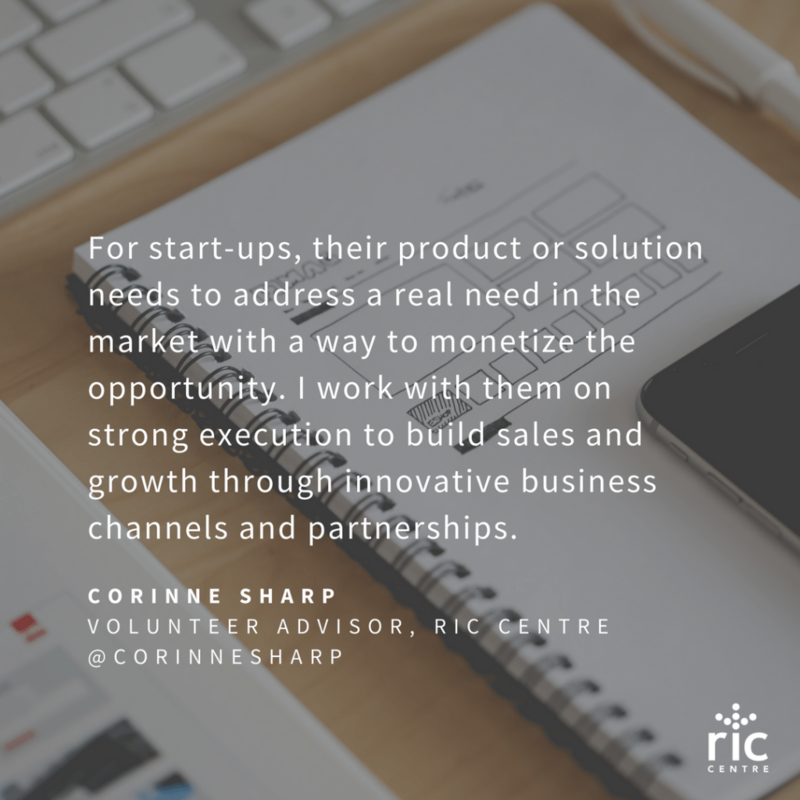 To entrepreneurs looking to startup their own businesses, Corinne advises them to be prepared and anticipate for all the variables in their business and the market they’re trying to serve. It’s also important to be smart about investment strategies and work with a strong team of advisors—the best ones bring unique experiences and perspectives to the table. For Corinne, having had the opportunity to so lead many change initiatives over the years has helped her guide her clients through the different phases of their businesses as a RIC Centre Advisor. Are you seeking advice on how to improve your go to market strategies? Register as a RIC Client today and gain access to all of our expert advisors and business start-up resources! You could have a chance to receive real time feedback on your go-to market strategy from advisors like Corinne Sharp in our Champion Series Pitch Panels.